For those that don’t know a whole lot about Middle Eastern cuisine, desserts could be the perfect entry point. They remind you that you do actually know some of these flavors: the rosewater in Turkish delight; the pistachios with honey and cinnamon in baklava; saffron ice cream; and of course, all those figs, dates and citrus fruits. 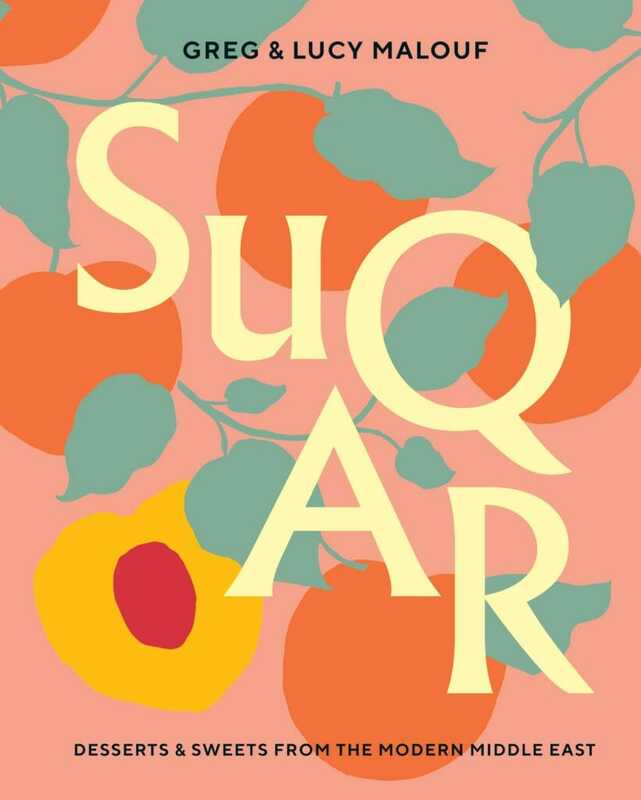 Suqar, by Greg and Lucy Malouf (Hardie Grant; $40) celebrates the sweetness of the region in a modern way. Greg, an Australian chef, draws on both his Lebanese heritage and experience working in the Gulf Region to interpret traditional recipes for home cooks outside the area, adapting them with more familiar (and accessible) fruits, a dash of sherry or brandy to balance a dish, or adding exotic ingredients to a cake or cookie you already bake. The book takes a wide approach to “sweets,” covering desserts and baking as well as ice cream, preserves and even drinks. It will surprise no one who knows me that while flipping through this beauty of a book I was stopped dead by the Clementine-Negroni Granita recipe. Clementine and blood orange juices are combined with sugar as well as a dash each of gin, Campari and sweet vermouth – the trio that make up a Negroni cocktail. Making a granita is usually a hassle because you have to keep raking it with a fork as it freezes to avoid ending up with a giant ice cube. But Malouf has a trick: adding a little gelatin allows you to forget it in the freezer while still rendering it “forkable” when you go to serve it. Genius! The Maloufs have collaborated on a number of books that focus on Middle Eastern food, and it’s clear that they have worked diligently to translate the flavors so that those of us living outside the region can understand them. Many of the recipes are simple enough for newbie cooks, but even experienced bakers will find plenty to explore in Suqar. Excerpted from Suqar by Greg Malouf and Lucy Malouf. Photographs by Alan Benson. Recipes Copyright © 2018. Excerpted by permission of Hardie Grant. All rights reserved. usually require to break up the ice crystals. Instead, you simply use a fork to scrape it into small chilled glasses as you serve. We use good-quality fresh fruit juice from the supermarket for this recipe, which makes it a breeze to prepare. Combine the fruit juices and sugar in a saucepan and heat gently, stirring from time to time, until the sugar has dissolved. Once the liquid is clear, bring to the boil, then lower the heat and simmer briskly for 1 minute. Take off the heat and leave to cool slightly. Soak the gelatine in cold water for a few minutes until softened. Squeeze out the excess liquid and add the gelatine to the hot juice, stirring to dissolve completely. Pour through a fine-mesh sieve and leave to cool. When cold, stir in the alcohol. Pour the mixture into a shallow container and allow to freeze into a solid block. 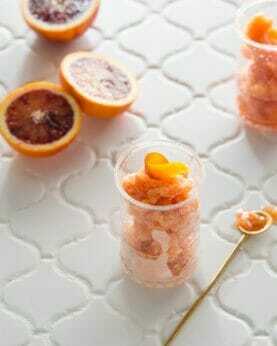 To serve, scrape the surface with a fork to create a smooth icy slush and pile into small chilled glasses. Gelatine comes in powdered and leaf form, and in many different brands/strengths. Problematically, there is no standardised approach to the setting properties of each, and one can’t simply be substituted for another. We always choose leaf gelatine over powdered, because we find the latter has a discernible smell and flavour and doesn’t always dissolve readily. Gelatine leaves used in commercial kitchens come in several different strengths, but these vary between countries (variously described as bronze, silver, gold, platinum and titanium). From our recipe testing, we’ve determined that the two commonly available supermarket products Costa Fine Leaf (in the UK) and Mackenzie’s gelatin leaves (in Australia) are sufficiently similar to be interchangeable. As a rule of thumb, we find that one small sheet is sufficient to set 100 ml (3½ fl oz) liquid to a soft, easy-to-turn-out set, or to set 125 ml (4 fl oz) to a wobbly, serve-in-a-glass set. If you don’t have access to either product, then our best suggestion is to follow the instructions on the packet. You will first need to see how many leaves are used in a particular recipe and estimate the quantity of liquid this will set. Then check what the manufacturer of your product recommends in terms of the amount of leaf or powder to set that amount of liquid. As with many culinary techniques, it’s usually worth doing a test run to ensure future success. To use leaf gelatine, it first needs to be ‘bloomed’: softened in a little cold water. When using multiple sheets, be sure to jiggle them about in the water so they are separate and don’t clump together. Once the leaves have softened and become slippery (don’t leave them too long, or they will dissolve) lift them out and squeeze them gently to extract any excess water. Add the gelatine to the liquid that is to be set (which must be hot). As the liquid cools to below 4ºC (40ºF), the gelatine will set it firm. A delectably moist tray bake that showcases plum’s affinity with cardamom. There is a generous quantity of crumble in the recipe below because, frankly, who doesn’t love crumble? 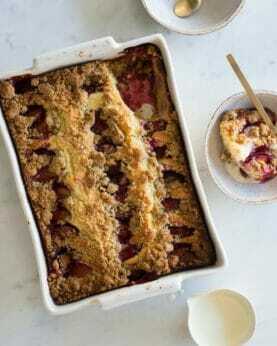 This is a useful recipe to have on hand to make fruit crumble puddings; either freeze it in its raw state and use from frozen as a topping for par-cooked fruit, or bake it for 15 minutes or so and store the crunchy crumbs in an airtight container to use as a handy garnish for all sorts of stewed fruits, ice creams or creamy desserts. To make the cardamom-clove crumble, combine all the dry ingredients in the bowl of a food processor and pulse a few times to combine. Add the butter and pulse until it forms clumpy crumbs. Place in the freezer for at least 30 minutes (or seal in a zip-lock bag for future use). Preheat the oven to 170ºC (340ºF) fan-forced/190ºC (375ºF) and lightly grease the baking tin. For the cake, first sift the flour, baking powder, bicarb and salt into a mixing bowl. Whisk the sour cream and vanilla together in a small bowl. Combine the butter and sugar in the bowl of an electric mixer and beat with the paddle attachment on medium speed for 4–5 minutes, or until very pale and fluffy. Beat in the eggs, little by little, ensuring that each amount is incorporated thoroughly before you add more. Lower the speed and add the flour in three batches, alternating with the sour cream. When the batter is very smooth, tip it into the prepared baking tin and smooth the surface. Arrange the plum pieces on top and bake for 25 minutes. Sprinkle the crumble evenly over the cake’s surface and return to the oven for 20–25 minutes, or until a skewer inserted into the cake comes out clean. Set the tin on a wire rack and leave to cool completely. Cut into squares and serve from the tin with tea or coffee, or as dessert with whipped cream. These light and spongy semolina pancakes are a speciality of North Africa, where they are known as baghrir. They are often eaten during Ramadan, enjoyed warm with honey and butter. 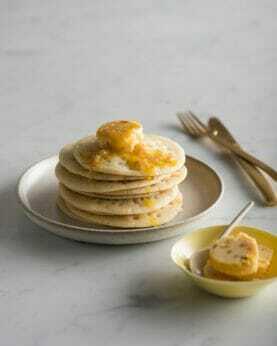 For something a bit more adventurous, we like to whip up a fruity date-lemon butter, which melts into an unctuous sweet slurry on the hot pancakes. The butter recipe makes more than you’ll need, but it keeps well in the fridge or freezer and is great to have on hand as an effortless base for quick butter sauces, for adding a quick flavour hit to savoury dishes, or just to spread on your morning toast. To make the date-lemon butter, blanch the dates in boiling water for 45–60 seconds. Drain and leave them to cool for a couple of minutes. Use a sharp knife to peel away the skins, remove the pits and dice the flesh finely, then put the chopped dates into a small pan with the sugar and water. Cook for 8–10 minutes over a medium heat, or until most of the water has evaporated and you are left with a sticky paste. Remove from the heat and leave to cool. Once cool, stir in the chopped lemon, then whisk in the softened butter. Spoon onto a sheet of plastic wrap or baking paper and shape into a log. Roll up neatly, twist the ends, tie securely and chill until required. The butter will keep in the fridge for several weeks or up to 3 months in the freezer. Sift the semolina, flour, salt and baking powder together into a large bowl. Warm the milk in a small saucepan to blood temperature. Stir in the dried yeast and sugar and stir until both are dissolved. Make a well in the centre of the dry ingredients. Dribble in the milk, whisking to combine evenly and to work out any lumps. Continue adding milk and whisking until completely incorporated. Finally, whisk in the egg. The batter should be silky smooth and the consistency of pouring cream. Cover and set aside for 1 hour until it starts to bubble. To fry the pancakes, heat a non-stick frying pan over a medium heat (there’s no need to grease it). Stir the batter gently, then pour half a ladleful into the pan. Tilt it gently to spread out the batter – you’re aiming for rounds about 12 cm (4¾ in) in diameter – and cook for around 60 seconds, or until little bubbles appear on the surface and it starts to dry. Check the underside: you may need to adjust the temperature so it doesn’t color too quickly. You’re aiming for a pale gold tinge, not chestnut brown. (Note: you are only cooking one side.) Serve the pancakes one at a time, hot from the pan, or stack them on a warm plate and keep in a low oven while you finish the rest of the batter. Serve topped with a thin slice of date-lemon butter. These translucent slices of syrupy citrus make exquisitely pretty decorations for all kinds of cakes and desserts. As well as being intensely sweet-sour, with a back-note of bitterness, their chewability means added texture, too. They can easily become habit-forming, and you may well find yourself looking for excuses to eat them. The recipe below is for confit lemons, but works with other citrus fruits too. Some of our favorite are ruby grapefruit, tangelo and clementine. Using a very sharp knife, trim the ends from one and a half lemons and cut crossways into 3 mm (1⁄8 in) slices. (Reserve the remaining half.) Carefully remove the pips, then transfer the lemon slices to a saucepan and cover with cold water. Bring to a gentle boil, then lower the heat and simmer for 3 minutes. Drain and repeat. Add the measured water to the pan together with the sugar. Heat gently, stirring to dissolve the sugar, then return the lemon slices to the pan. Bring to a simmer, cover the surface with a circle of baking paper to keep the lemon slices submerged and simmer very gently for 45 minutes. Test to see if the lemon skins are tender; if not, continue cooking for a further 10–15 minutes, or until they are. Use a slotted spoon to carefully lift the lemon slices into a shallow lidded container. Measure the syrup and, if necessary, simmer to reduce it to 125 ml (4 fl oz). Remove the pan from the heat and stir in the juice from the reserved lemon half. Pour the syrup onto the lemon slices; ideally, they should be fully submerged. Cover and leave overnight before using. They will keep well in an airtight container for several months.